Antony Wolfson is an internationally renowned entertainer. He was rated number #1 UK & Worldwide Rock & Roll Artist 2013 by premium independent global music brand, ReverbNation. He is personally known and highly commended by those that knew and worked with Elvis Presley, including Elvis\'s High Voice Singer, Kathy Westmoreland, Elvis\'s best friend and confidant, Joe Esposito and Elvis\'s Fiancé, Ginger Alden. His music is inspired by the incendiary, explosive early Rock \'n\' Roll of the mid-South Memphis \'Sun Studio\' sound. Antony performs his music as himself - in his own way - rather than as a \'tribute artist\'. His music is brought to life by his vocal performance and stage presence. Kathy Westmoreland describes Antony\'s voice as simply \"Beautiful\" and Antony is proud to call her a friend. He is a vocalist entertainer with a very large global following - he has over 50,000 fans on his music page alone. He has performed on stage at venues all over the world including London, Australia, and across the Costa Del Sol at the top venues in Marbella, southern Spain. His success in Marbella is unmatched by any other performer in such a short period of time - in a little over 12 months Antony was performing at the very best 5-star hotels six nights a week. He is the most in-demand performer on the Costa Del Sol performing up to 13 shows a week. His fan base is huge and his shows are booked up many weeks in advance. The numerous reviews on TripAdvisor by audience members for his shows speak for themselves. Antony has a number of high-profile entertainment residencies perfoming at the very best venues in Marbella and the Costa del Sol including being lead entertainer for the Marriott Hotel Group, Resident entertainer at the famous 5-star Los Monteros Hotel & Spa and the renowned Alanda Club Marbella - where he performs weekly shows to large audiences often in excess of 200 people a time. His shows are regularly booked up with guest feedback evidenced publicly on TripAdvisor. Antony has appeared on international TV where he has been interviewed and performed. In 2010, Antony performed in Melbourne, Australia, where he met and was heard by Joe Esposito - one of Elvis\'s closest friends. Joe described Antony\'s performance in one word, \"Wow!\" and asked Antony to attend a special Elvis Presley night in Melbourne as his guest. 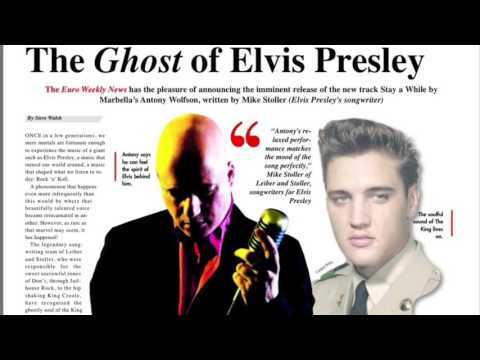 In 2014, Mike Stoller, of legendary songwriting team, \"Leiber & Stoller\", (who wrote for Presley himself), was so impressed with Antony\'s vocal that he gave him a song, written for Elvis but never recorded. The song called \"Stay A While\" was recorded by Antony in 2015 to massive media attention. His recording of the Leiber & Stoller song, \'Stay A While\' resulted in Mike Stoller himself saying, \"Antony\'s relaxed performance lends itself to the mood of the song perfectly.\" The prestigious Hollywood based music awards by Akademia awarded \"Stay A While\'\' winner of the Best Rock/Funk song category in November 2015. A tremendous accolade. In 2014, Antony met Sir Tom Jones who attended one of Antony\'s shows at the 5-star, celebrity Hotel Los Monteros in Marbella - chatting with Sir Tom during and after his performance. Sir Tom Jones said about Antony\'s performance, \"A great singer and entertainer.\"